World wide, Shotokan is the most practiced style of traditional karate. The reason for this popularity is obvious to anyone who takes a close look at the art. The tremendous power generated by the techniques of Shotokan make for very effective self-defense. The degree of effort and control necessary to generate that force also makes Shotokan one of the best forms of exercise available. Shotokan karate is not easy to learn without proper instruction. It is filled with subtleties and small details that are extremely important to the art of Shotokan. We understand the difficulties involved in learning Shotokan, or that of any martial art. We know that many of you have limited training hours. Even those who are lucky enough to receive quality instruction can get frustrated because it seems like too much to learn all at once. Our Shotokan Karate DVDs make available to you a level of instruction that is only available at the top Shotokan karate schools in the world. Discover what karate-ka all over the world have found: quality instruction and the information you need to allow you to reach the next level of performance in your martial arts. The husband and wife team of Joel Ertl and Anita Bendickson are the owners of the Midwest Karate Association of St Paul. They have been running the dojo together, in affiliation with the Midwest Karate Association of Minneapolis, and Sensei Robert Fusaro since 1979. Their instruction provides a family oriented blend of adult and children’s classes and self defense programs. They have taught thousands of students through the years and know how to get their message across. Sensei Joel Ertl received his 6th degree black belt received from Master Hidetaka Nishiyama in 2004. Sensei Ertl began training in Shotokan karate in 1973. His instructor is Master Robert Fusaro. Sensei Ertl has been teaching karate for the Midwest Karate Association on a full time basis since 1976. Since 1979 he has been the chief instructor for the Midwest Karate Association of St. Paul. 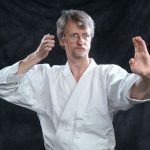 Sensei Ertl is currently the Regional Director of the Traditional Karate North Central Region (NCR) for the American Amateur Karate Federation (AAKF). He is a member of the NCR Technical Committee, and a qualified judge with the World Traditional Karate Federation (formally ITKF). While Sensei Ertl was still competing in tournaments, he was a prominent competitor. His many accomplishment include first place in Individual Kata at the 1989 AAKF National Tournament. Sensei Ertl was also a member of the Minnesota kumite team in 1983 which took first place in the AAKF National Tournament. 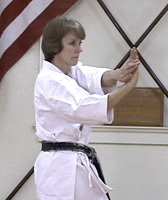 Sensei Anita Bendickson is a 5th degree black belt. She began her karate training in 1975 under Master Robert Fusaro. She received her 5th degree black belt in 2007 from Master Hidetaka Nishiyama. Along with her teaching duties at the Midwest Karate Association of St Paul, Sensei Bendickson also teaches many self defense coures around the Twin Cities area. Among these courses are accredited classes at the Univeristy of Minnesota, Macalester College and the University of Wisconsin in River Falls. Along with these classes she is in constant demand for self defense workshops by area corporations (3M, for example) and community groups. Anita is also a member of the NCR Technical Committee, and a qualified judge with the World Traditional Karate Federation (WTKF). Now retired from competition, Sensei Bendickson has many tournament accomplishments. Among them are the AAKF national women’s individual kata championship in 2001. She was also the women’s kumite champion in 1982 and 1989. She has been a member of the national champion synchronized kata team many times. As a member of the USA team she competed in the 1983 ITKF World Tournament in Cairo, Egypt and again in 2000 in Bologna, Italy.